This is a place for parenting tips, ideas and knowledge share to help you make the most of our product. Be sure to check back often for new articles and updates. Summer is the Season for Activity Dollars! KidCash dollars can be used in any way you seem got or think would motivate your children. With the nice weather and summer approaching, there are a lot more choices and opportunities for activity dollars. What I've been doing with my two toddlers is that I let them earn them by efforts towards anything that teaches them them the importance of physical activity. Activity dollars are just a visual and easy way to correlate messaging with reward driving those lessons deeper in what I hope will last a lifetime. They are rewarded activity dollars for running in the park, for doing jumping jacks in the living room, for trying their best at soccer and tee ball. They get extra dollars at the end of a season as a reward for accomplishing a task that spanned a long time. I let these dollars accrue all throughout the other seasons. In the summer they become ride and arcade game tickets for all of the wonderful amusement parks we frequent during the summer months. It's pretty much the "cats meow" as far as the kids are concerned. While they are having fun I remind them how they earned their dollars. I explain how a balance of physical activity affects the body. That it makes you feel good, that things that physical activity will appear in their minds to be easier, they will sleep better, can eat more treats and so on. How do I know this has been a successful approach? I know whenever I see my children making choices on their own without being asked and reciting my messages back to me. Ironically all of this has been making me more conscious of making better choices in my own life. It feels weird to feel like this is coming back to me but being mindful of benefits are the basic mechanisms for behavioral change. I hope you have fun with your children this summer and as always, happy parenting! My son is nearing the age of six and has now been using KidCash for almost four years. I originally developed this tool because of the stress I was feeling whenever we would get into a power struggle between what I wanted him to do and what he wanted to do. Even back then, rote compliance was never what I wanted. I wanted him to understand why the rules were important. I wanted him to be able to think on his own. I wanted him to have more patience since many rewarding things take time and effort in life. I wanted him to trust me when I said something. And most importantly, I wanted to get his attention. There's a moment of selfless happiness when you give. Let your young ones see this for themselves by giving them the power to buy. Gift Cash can only be spent on others, and is typically rewarded for moments of sharing and generosity. It’s a great way to start good habits early. Also remember that gifts don't have to be bought. Get your children exploring Arts and Crafts and try to make something or have them help clean up the house. Later you can maybe give the child some bonus bounty for a job well done and amplify the feelings of joy when giving. Children are like growing flowers, you want to make sure you build them up right. Happy Parenting! Considering I'm the creator of KidCash, you would probably assume that both me and my husband implement the system fully. I mean we do some of the time, but the majority of the time...it's mostly me. My husband has a very distinct set of beliefs when it comes to parenting which are more the loving yet strict upbringing he learned growing up. His parenting is more about laying down the law and setting expectations that the children should follow those laws. It's a pretty common method of parenting, is effective a lot of the time, and he's also a fine example for them to follow. He verbally teaches them values and works towards the same goals as I do but we approach the "how" differently much of the time. So...why not ask him to use KidCash all of the time? So you want to get your kid to change a behavior. KidCash is here to not only make it a positive experience, but something that is fun, builds trust and no-stress. Here's a quick run-down of the steps you will encounter. When it comes to your children choosing the path that you want them to walk, it comes down to two things. Number one, understanding what the brain goes through when making decisions so you can devise a smart plan of attack...and secondly, knowing that if you successfully create a habit that they feel good about, then you can have the reward of knowing they will want to choose that choice from now on without you having to ask. Well that's the dream anyway. There are a lot of things you want to teach your children and a big part of doing so includes effective communication. If your child doesn't want to listen, has their face glued to a screen or is trying to assert control by purposefully shutting your words out, it could be a frustrating and inefficient process towards any type of constructive change. I have to admit, I was laughing when I designed the Violations for KidCash because even the word alone is scary looking, but they have one of the most important purposes within the system and that is communication. Normally when there is unwanted behavior, the next decisions and actions may be motivated by a desire to gain control over the situation. Say little Johnny is screaming in the restaurant. You might just grab his attention and tell him to stop, but he doesn't. You trying to control him triggers a similar reaction back and before you know it, you're involved in a power struggle. It is at this moment when both of your brains are now becoming emotional, probably less logical as fight mode is driven by adrenaline and the more reactive parts of your brains. What this means is that the situation is set up very poorly for communication or active listening to happen. People who run marathons know the importance of setting a proper cadence, and the parenting is probably one of the longest marathons you will ever experience. Setting a high level plan for your morning, day, week month or even year can not only help you worry less, but it can get a lot of the thinking off of your mind so you can concentrate on the tasks at hand. It's as simple as figuring out what's important to you, thinking of a doable plan and learning how to get into a non-thinking rut about it. With Easter right around the corner, there's a good chance those delicious yellow peeps and giant chocolate bunnies will soon be surrounding you and your children in a delicious deluge of sugar. Sugar in and of itself is not a bad thing for most people, it is when it's consumed out of balance. This is the very thing that I like to communicate with my children when budgeting their junk food intake. If I were to ask you to describe all of the things you love about your child or children, you probably have so many positive adjectives we would run out of room here to list them. Im sure you want them to know this for themselves. Unfortunately, they are exposed daily to standards that they may not personally feel they can live up to. The media, merchandise and even their peers can make your child less than adequate and that's a horrifying thought for many parents. So what can we do to build our children up? Tests and report cards are excellent opportunities to connect with your child on the kind of thought processes that will get them through this year and ultimately for the long term. Here are some tips on how to use these unique moments to raise motivation and give them a few points to focus on. Every parental fear you have could be seen as your subconscious doing you the favor of reminding you of something you should be talking to your kids about...and probably the sooner the better. What are Some Things Parents Can Do Daily to Teach Kids Money? Here are some tips on different ways you can use KidCash to teach your children basic finance early on. It will not only help them with balancing their budgets in the future, but teach them discipline, patience and more as well. Not every day can be a perfect day. Actually, who am I kidding, there's multiple occasions every single day where I do things that I wish I could improve on. It's totally normal but what if we want to make improvements? Let's take a second to consider why a Daily Review is beneficial for everybody, kids and parents alike. If you've ever worked in a corporate environment you might have had a retrospective meeting. For those who don't, the practice, sometimes referred to by it's macabre origin as the "post-mortem" originates from an examination of a deceased person to determine the correct cause of death. The purpose of this meeting is to figure out what went right or wrong, what will be avoided in the future, what processes can be improved so the next project may be more successful. School IS boring. Let's be real. The big problem with boredom is that it decreases motivation in an overwhelming way. This is probably going to make everything you are trying to do for your child's future career as a rocket scientist plastic surgeon a bit tough to achieve. Here is how you can incentivize your children to get through it. According to an article at parenting.com, there was a study done by AVG Technologies that surveyed more than 6,000 children, ages 8 to 13. They discovered that 32 percent of children felt unimportant when their moms and dads were distracted by their phones. The kids said they had to compete with technology for their parents' attention, and 28 percent of mothers and fathers agreed with this observation. “But there’s one important difference,” Poldrack says. And this difference makes the pleasure-based habits so much harder to break. Enjoyable behaviors can prompt your brain to release a chemical called dopamine. “If you do something over and over, and dopamine is there when you’re doing it, that strengthens the habit even more. When you’re not doing those things, dopamine creates the craving to do it again,” Poldrack says. “This explains why some people crave drugs, even if the drug no longer makes them feel particularly good once they take it.” In a sense, then, parts of our brains are working against us when we try to overcome bad habits. “These routines can become hardwired in our brains,” Volkow says. And the brain’s reward centers keep us craving the things we’re trying so hard to resist." Dozens of studies show that willpower is the single most important keystone habit for individual success… Students who exerted high levels of willpower were more likely to earn higher grades in their classes and gain admission into more selective schools. They had fewer absences and spent less time watching television and more hours on homework. “Highly self-disciplined adolescents outperformed their more impulsive peers on every academic-performance variable,” the researchers wrote. “Self-discipline predicted academic performance more robustly than did IQ. Self-discipline also predicted which students would improve their grades over the course of the school year, whereas IQ did not.… Self-discipline has a bigger effect on academic performance than does intellectual talent. Social Proof is a powerful incentive that is used throughout the KidCash system. What it does is build up trust between the things you are saying and what they are seeing with their own eyes. Once you are a credible source of information, they will follow you naturally. The way that you do this is by connecting the dots between the things they observe in the real world with more information in a way that helps them navigate their world. As a parent, you know what interests your children. Use these emotions to cement stronger ties between concepts and goals you want them to work towards. Show them examples that will inspire them, resonate on their level and show them how to safely increase their freedom in their world. Here are some ways that you can do this. Considering it's the New Year, we wanted to take an opportunity to spread the word how crucial each YEAR really is for a young toddler. A world-famous study by researchers Betty Hart and Todd Risley (1995) found that some children heard thirty million fewer words by their 4th birthdays than others. The children who heard more words were better prepared when they entered school. These same kids, when followed into third grade, had bigger vocabularies, were stronger readers, and got higher test scores. The bottom line: the kids who started out ahead, stayed ahead; the kids who started out behind, stayed behind. This disparity in learning is referred to as the achievement gap. Toddlers don't often have the allowance to spend on gifts but with KidCash, it's completely safe and doable. Let them truly experience giving with our Gift Cash, a currency they earn by thinking about others and can't be spent on themselves. Selflessness is an important trait for a developing brain to develop. With positive feedback loops with our incentive system, we hope it's something that sticks for life. Learn more at www.kidcash.com. Happy holidays from our family to yours! KidCash Tip: Use different levels of incentives to keep them motivated and the excitement fresh. Novelty and variety are great ways to peak interest and add energy to what could be a stale situation. One way to do it is to create different barriers to rewards. It's as basic as leveling in games or badges in apps. With KidCash, you could use the different currencies as rewards for specific activities, such as activity dollars for shown effort in a soccer game. You can also use these currencies for specific rewards, such as activity dollars being used to win them a trip to the place of their choice on the weekend. Use bonus bounty as a way to quickly earn dollars for special achievements, such as waking up and getting dressed quickly, or sharing with others. You could also make the ability to use the dollars reliant on certain benchmarks. For instance, our son now has weekly tests and is told that if he tries to do well throughout the week, that allows us to take him to the toy store to spend his hard earned cash. Otherwise he has to wait another week. Be creative, be positive, be fun. Reward the effort and not the outcome and hopefully your child will find challenges fun and exciting. Happy parenting! Ryan has been going through one of those phases where they want to test their boundaries. Not only is this perfectly natural but his version of this is fairly benign and doesn't bother me much. Instead of following his normal routines, he's been pausing, making this stunted smile expression and then decides to see what happens if he doesn't do it. To me, it presents a fun challenge. How can I turn this experience around to make you want to do what I think you should. Again I took a step back and tried to think about what happens in my adult life when I don't want to do something myself, and the answer was simple. I pay someone to do it. We love naturally motivating our little ones to push themselves to try harder. Set times where you will go through their work to check for opportunities to reward Bonus Bounty and reward them for times when they've gone that extra mile that week. Try to highlight whatever skills your child's teacher is trying to stress that week. You can also use trips to the Toy Store as special rewards for tests where you felt they tried their hardest. Also remember, it's important to reward effort and not outcome as they can only truly control how they apply themselves. As always, Happy Parenting! Say hello to the newest member of the KidCash family. This small business services the special needs community of NYC and is the only of its kind so far. They've recently been featured in the Wall Street Journal and are located in Staten Island. Most of these items were only available online previously, which drove the owner to open up this shop. We are excited to work with them and hope you spread the word to those you know. Find out more about the Island Sensory Shoppe at: https://www.facebook.com/islandsensoryshoppe Catch a video special from the WSJ: http://on.wsj.com/1Sn90Zw Shop Small. Support Local. Happy Parenting! Incentives + Reasoning = Long Lasting Behavioral Change Let’s say you’re trying to get a bunch of kids to eat more nutritious food. What’s the best way to do this — education, moral urging, or plain old bribery? That’s one of the questions that a pair of economists set out to answer in a recent field experiment in Chicago. In this podcast, you’ll hear from both of them: John List, a University of Chicago professor (and co-author of The Why Axis who’s familiar to readers of this blog); and Anya Samek, who teaches at the University of Wisconsin-Madison. They tried several methods to see what would make kids choose fruit over a cookie. One trick, Samek tells us, easily beat the rest: SAMEK: It actually works every time. So we come in five times and every time we have these really high rates of selection of the fruit. Listen to this podcast here: http://freakonomics.com/…/why-you-should-bribe-your-kids-a…/ Help us educate by sharing this to your fellow parents. Happy Parenting! Children who can resist eating a raisin for 60 seconds are more likely to do better academically, a study suggests according to this article from the Telegraph: http://www.telegraph.co.uk/…/Currant-thinking-how-a-raisin-… Excerpt: However those who show enough self-discipline to wait for a whole minute are destined for greatness, according to academics. By the age of eight the youngsters who resist temptation will have an IQ of 7 points higher than those who ate the fruit early. Researchers say the game tests attention span and learning capacity and could also be done with chocolate, a marshmallow or ‘nibbles.’ The team at the University of Warwick are particularly interested in using the game to find out if premature babies will have learning difficulties. Professor Dieter Wolke, who is based the Department of Psychology and at Warwick Medical School, said: “The raisin game is an easy and effective tool that is good at assessing inhibitory control in young children, takes only 5 minutes, and can be used in clinical practice to identify children at risk of attention and learning problems. “Better inhibitory control at age 20 months predicted better attention regulation and academic achievement at age 8 years. “The results also point to potential innovative avenues to early intervention after preterm birth.” Help us share this. Happy Parenting! Game mechanics? What's that? Game mechanics and traditional incentives are the secret sauce that make KidCash an effective tool for parents, because motivating children isn't easy. Tasks that are lacking in stimulation or a challenge can easily become boring or frustrating. That's why incentives are found in everything from games to apps to the work place. It takes a lot for a child's growing mind and lack of coping mechanisms to stay motivated. This task is even more difficult if you don't have the right tools at hand. We are trying hard to help the millions of parents out there in their daily struggle! Our flexible system of components are based on society to be as relevant as possible but modified to be fun and simple for children. It can be set up in limitless ways to help you create the kinds of incentives you need. These game mechanics can naturally encourage your young ones to want to make better choices, to become more independent and strive to be their best with much less stress on your part. 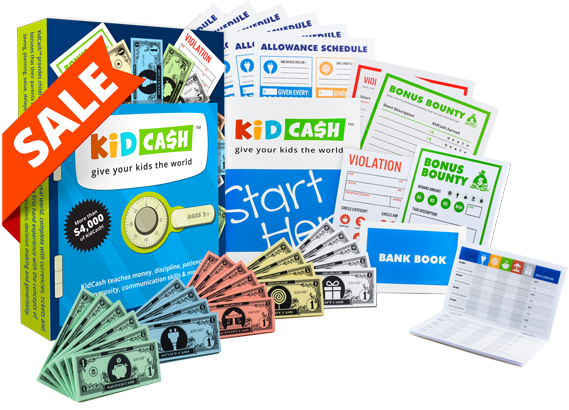 Combine these high level strategies with KidCash to "Make Parenting Easier" for you. Make sure to visit our page to see the nine main incentives we use and how when combined with KidCash can empower your child to do anything they set their minds to. Go now to: http://kidcash.com/power As always, Happy Parenting! Still have a giant bag of candy from your Halloween haul? Help your children budget that sugar with candy dollars! Don't be the bad guy when it comes to saying no, simply change the situation. Watch them get excited react gratefully when you do offer the surprise opportunity to pay you for a piece of candy. Discourage self-entitlement by giving attention to things events that happen as a result of earning over time. Reiterate verbally the feeling of joy when a reward is received. Educate your children why candy and sugar should be limited to add logic and reason behind the rules. Not only will the candy and fun last longer but they will feel better too. Combine all of these tactics for a happy healthy post Halloween season that are good for the long run. As always, happy parenting! Help your kids build relationships with their siblings (or others) that last by teaching them empathy, respect and generosity. 1. Create opportunities for kids to help each other. Explain to your children that helping others makes them happy, and you happy. Reinforce acts of kindness at allowance time with Gift Dollars, which can be used at a later time to help a sibling out of a bind, or to help them buy the thing that they want. It reinforces this concept of helping one another out on different levels from many angles. 2. Insist that they respect each other. Make sure that the rules are clearly laid out, and the reasons behind the rules demonstrate the benefits of having respect for one another with empathy. We don't hit because it hurts the other person. We don't spit because we don't want to get others sick. Use violations to reinforce these boundaries and to make sure they know why the rules exist. 3. Practice sharing. Whenever there is a dispute over a coveted item, tell them that they should share with one another, because they love each other and should want to make the other happy. Give them options of things that can soften the blow, such as playing with another fun toy directly afterwards, or giving positive attention to reward them. Gift dollars will remind them at a later time how kind the act was, that it was noticed and appreciated. 4. Give them opportunities to make one another happy. Use gift dollars as a way to offer one sibling get another sibling something that they really want. Encourage the receiver to express gratitude and show them that their relationship has many fun benefits. Get them into the habit of giving and saying thank you regularly. Small seeds go a long way with children so have them practice the good ones often. Happy Parenting! If you want to help your child make better financial decisions in the future, this study shows the importance of starting early. In 1991, researchers Rona Abramovitch, Jonathan Freedman, and Patricia Pliner published a study (http://psycnet.apa.org/psycinfo/1991-32827-001) in which 60 girls and 60 boys aged 6-10 years were given either $4 in cash or $4 in credit to purchase items in a store. The amount that they did not spend in credit would be given to them in cash. They found that children who did NOT receive allowances at home spent MORE when they received store credit than when they received cash, while those who got allowances spent the same amount whether they were given cash or a credit card. Neither age nor any other background variables affected the amount spent. I found this striking—receiving an allowance did indeed impact children’s financial responsibility, even at this young age. Imagine how much better they could be at saving, budgeting and maybe even investing by the time they got to college if these children had another decade to practice. Food for thought. As always, Happy Parenting! One great parent inspired idea was custom mailboxes for Bonus Bounty. Give children a reason to wake up on Saturday Mornings. One idea is let them make their own mailbox that can either go on their bedroom door or in a communal room. If there’s something they really want, let them know that when they wake up, there will be opportunities to earn extra dollars in their mailboxes. If they wait too long, somebody else might pick it up. Here are some cute DIY mailboxes from Pinterest: https://www.pinterest.com/search/pins/?q=kid+room+mailbox&term_meta%5B0%5D=kid%7Ctyped&term_meta%5B1%5D=room%7Ctyped&term_meta%5B2%5D=mailbox%7Ctyped Happy Parenting! The power of explaining the rules. In 1978, a study was done to see if a person could cut others in a line to make a photocopy at the machine. Several variations were tried but it was found that if a person simply followed the request with "because" and a reason as nonsensical as "I have to make copies", that people would comply. (Read more at https://www.psychologytoday.com/…/the-power-the-word-becaus…) Children react similarly when you simply explain to them why a rule exists. Some examples are: - Spitting warrants a ticket because it spreads germs and I want you to stay healthy. - Sharing gets you a bonus dollar because it's good to think about others more than yourself. - You'll have to pay me a dollar if I have to dress you in the morning because that's what people do sometimes. They pay others to do services for them, but if you dress yourself, you can save that dollar for something better. What this does is make them feel that the rules are there for a reason, that you love them and want what's best, that the structure you create for them is fair and after a while, they will trust you and the system. We hope you see less struggles by applying this method and as always, Happy Parenting! Teaching your child generosity and empathy now can help them develop into the kind of person that helps others in the future. I know that when I peer into the future, I want a child who thinks about others, bigger world around them and have a desire to impact their environments in a positive way. Use gift dollars when you see your child sharing, caring and thinking of others. Children naturally love presents so when they see this particular reward, they already know it's for something good. Gift dollars are the one currency that can't be deducted for violations. Children can use them to get others gifts, and get to feel on a deeper level that they really earned that right to give. Nightly meetings are also meant to create a habit of talking to one another. You have your children's full attention when they're about to receive their allowance. Doing this daily creates trust and an open ear for when you want to explain important things to your children. Baby center has a great article on how to teach empathy to toddlers here: http://www.babycenter.com/0_the-caring-child-how-to-teach-e… You can learn more at www.kidcash.com. As always, Happy Parenting! School is starting again and we want to help naturally motivate your children through the tougher parts of homework and day to day. When you give your children allowance, what you are really giving them is a better way to exert control over their lives. Suddenly, when it matters to them the most, they now have the power to buy. How this plays out when they need to make a decision is that this desire for increased control is now a part of their immediate mindset. This works in the same way it does for adults. When mom wants to speed, she thinks, wait I could get a ticket. When your child wants to have a tantrum getting ready for school, they will hesitate. If they know extra effort will gain them bonus dollars, that will help them want to finish the task. With school either starting or just around the corner, KidCash would like to make it easier for you to talk to your children about bullying by providing an easy place to watch videos, educate and incentivize. Research states that 1 in 4 children deal with bullying. By preparing your child for these situations, you may be helping your child teach other children the right thing to do when it happens. Remind them that we are all people, no matter what the cover looks like. Here are some videos you can watch with your children to help you talk them through the right course of action should they be confronted with a bully: http://www.kidcash.com/brainstorm/bullying Bonus Bounty Tip: Ask them in the next few days to recall what they should do when confronted with a bully. Ask them how the other person would feel if they didn't help them. Reward them with bonus bounty if they can recall the correct answers and praise them for paying attention to something that is very important. We hope our collections of video help you out. As always, Happy Parenting! Use KidCash Bonus Bounty to naturally motivate your young ones to read. How? Slowly encourage them to recognize sight words such as street signs or in books, and when they get new ones right, make a big fuss about it again at allowance time. Praise effort above all. Explain to them how the path of education leads towards a job that will help them have more freedom as adults. The earlier the better too. According to a study, when the young children were being told a story, anumber of regions in the left part of the brain became active. These are the areas involved in understanding the meaning of words and concepts and also in memory. These same brain regions have been found to be active when older children listen to stories or read. One mommy decided to share with us how she is using KidCash. Thank you mommy! I have two sons- Logan, who is 5, and Shane who will be 4 in October. We have been using Kidcash on and off for over a year, and I find that it really helps my children to think about decisions before throwing tantrums, because they are given a choice. I am a teacher, and the only reason I say we have been using it on and off is because it is easier for me to implement when I am home full-time- andwhat a difference in behavior! I actually have been teaching the boy's caregiver how to use it, so we can keep it going! To continue where I left off, I had stopped using it for a while just to see what would happen. As if on cue, Ryan started having more frequent temper tantrums, demanding things, wasn't happy with what he had, and wouldn't listen so much so that my husband complained to me about it. I would still offer the dollars to him but when I wouldn't create opportunities for him to spend it in any way, after a while he became disinterested and told me he didn't know where his wallet was, or that I could give him his dollars later. Why I stopped using KidCash for a month and what happened. As a user experience designer and the creator of this product, it's a part of my due diligence to experience things that are likely to happen, one of these is that the parents stop putting the effort into having the children use the dollars and start giving in to natural parenting behavior such as buying them things when they ask, etc.. With the summer in full swing and without the added distraction of school, I decided to give it a rest for the past month. I stopped creating instances where they would pay me dollars for things such as iPad use, treats etc.. just to observe what would happen. I didn't even really say anything to my husband since I didn't want to distort anybody's perceptions of anything. One of our favorite (and one of my children's favorite) currencies are gift dollars. We reward them in moments of sharing and generosity. Having that moment recognized not only magnifies the overall feeling of good when it happens, but is again mentioned at their daily review along with the monetary reward. They later have another positive experience when they spend it buying someone a gift. We've seen the natural motivation build for these types of behavior in our own household but a study in the Washington Post suggests it could go much farther - Kindergartners who share, cooperate and are helpful are more likely to have a college degree and a job 20 years later than children who lack those social skills, according to a new study. The irony of giving children things for free. As a parent, what a delight it is to see that moment of pure bliss on your child's face when they get the thing they were asking, begging and pleading for. We want to give our children the world. We want them to know that we are always there for them, that we can provide everything they need, protect them and smother them with generosity because we love them. But is this how they perceive it? We went to a waterpark this past week. My husband tends to be the one to give them things for free. I like to be the bad cop who makes them earn and wait for things which is fine because in real life, sometimes people give you things but you can't expect it all of the time. Your kids desperately want your full attention but it's hard being 2-3 feet tall and out of reach. With the ever multitude of digital devices to get between us and our young ones, children are not only being ignored regularly but learn to ignore their parents in return. Face to face time can be impactful when it comes to relating to them in a way where there is open communication and a meaningful human connection. It's also not easy. It takes effort to be mindful and set a cadence of interactions where your child gets your full attention but it's worth it. Imagine what habitual deep intimacy with your children could do when they're piloting their ways towards individuality and the waters of their teenage years. Sometimes forcing yourself to take one step can make the rest fall into place. Instead of overthinking it, just place your phones, tablets, and tv's far off and simply lie on the floor. How Do You Know You're Doing it Right? How do you know you’re doing it right? KidCash is more about the exposure to positive and negative emotions connected to important lessons rather than the physical act of giving out dollars. You want to create these with enough frequency for them to “get it”. They should feel discomfort enough times to understand the consequences of tickets. You want to make sure that they are feeling the slight pain of having their freedom limited by having less income than they should have had. They need to experience the disappointment of not getting something they wanted. They need to feel the slight discomfort when it comes to admitting what they did wrong when getting a ticket, enough times to make sure they understand. They should also uncomfortably tell you what they should do the next time to correct the bad behavior, and why it ultimately helps them or others to avoid the violation. Summer is coming but that doesn't mean your kids should stop the school lessons! We try to tackle problems goal first, and then work backwards towards solutions that will increase chances for success. When the goal is doing well in school, I want my child to be as motivated as possible. It would be easier to accomplish this if education was viewed as useful and important. Whenever possible, I try to show examples of how the information he's learning could help him do things on his own. One example is the other day, we were at the zoo. He asked where we were. I told him that I would give him a bonus dollar of his choice for each and any of the words he could read that day. I helped him read the sign "world of birds". He half got them once we started sounding out the letters and I made a big deal out of it. "Great job Ryan! That's a bonus dollar! You see? If you learn how to read you can tell mommy where we are and where we want to go next time!" I tell him that the reason we do homework and go to school is so that he can do things on his own. I tell him that his teachers work really hard because they care and want to help him know the world better. If he feels that education truly benefits him and will give him the things he ultimately wants, he will see the bigger picture which may give context as to why he should do something that may seem unpleasant or laborious at the moment. So be creative and use those bonus dollars for good. Keep those minds going always. Happy Parenting! A lesson in paper... KidCash strives to be a quality product and company. We cut no corners when it came to the kind of paper our currency is printed on. Paper weight refers to the weight of the parent size sheet the smaller sheets are cut from. Most people are familiar with 20lb paper as it is one of the most common papers found in offices and homes. When you hold a KidCash dollar in your hand, you will immediately feel the difference. We want not only an attractive product but one that lasts. Please note that to visually show the difference in size between the two weights, we used stock imagery. The pictures we attempted to take were all dark and grainy so we gave up. hahaha. You should also note that we make our product in the United States with an amazing printer who produces all of Amtrak's printed materials amongst other things. Check out their video here: https://vimeo.com/129245131. We strongly believe that our product should start strong and support our country. We make decisions that feel good to us at the end of the day. Thank you for supporting us. You can always come back to this information here: http://www.kidcash.com/quality-first Happy Parenting! Praise children for the effort, not the outcome. When using bonus bounty, we want to reward the things your children have control over and not the things they don't. If it's academics, we suggest focusing on the level of effort and not the grade. If it's sports, praise the practice and giving it all, not the score. This way, no matter what happens, they will feel good about what they did and will continue on a path most conducive to a great outcome. Helping children understand the reasons things happen can help them take control over their reactions and reduce frustration in a lot of situations. Say you are trying to tackle tantrums. When a tantrum occurs, explain that they are not acceptable, and can warrant a ticket. Explain that when the mind becomes angry, the body creates chemicals (cortisol, adrenaline) that keep the body angry and the part of the mind that is initially triggered doesn't think logically, so the trick is to get the thinking part of the mind activated. The thinking part of the mind handles language so sometimes telling yourself a sentence like "hold on, let me think about this" can help you gain control. It may sound like a subject that is too complex to tell a toddler but you'd be surprised how they take this information and how it helps them understand what to do. Ryan always wants to know more. If the tantrum continues, declare a ticket to be issued. I recently explained to my four year old that it's not really dollars I'm giving him every night but choices and the experience that will bring him knowledge that can give him more options in the future. Each day, he can choose to do the right thing and earn his allowance. He can choose to do the wrong thing and get a ticket. He can choose to spend his money or choose to save it. Life is full of variables. If he learns how to attain goals, discipline and responsibility, he will have a better shot at being able to pursue the career he likes, create the experiences he wants to pursue, and have the balance that makes him content. We are excited to announce that KidCash is now selling at Kaleidoscope. Rated the #1 Toy Store in NYC by the Daily News, we couldn't think of a better store to start this voyage with. We are truly excited to have them be our first vendor. Please always try to support local and visit their site athttp://www.kaleidoscopekidstoys.com/ --- Kaleidoscope offers the best in educational and specialty toys for newborns through tweens and is located in the heart of one of the primary Brooklyn neighborhoods. Basic principle of our inventory selection lies within the premise of open ended play to help promote various stages of development and creativity. Our online store mirrors this concept and serves parents as a personal assistant to help them navigate easily as they shop by age, interest and play and learn categories. Member of The American Specialty Toy Retailing Association (ASTRA) Press: Honored and received the Best Toy Store title in New York by Daily News. Best places to visit in New York, honored and mentioned by TONY, Red Tricycle and Mommy Nearest. Going away for Memorial Day weekend? Use your bank books! I have two triggers for when I have Ryan pull out the bank book, when I'm running low on cash and when we are going out. This weekend we want to hit up some aquariums, boardwalks and places with rides and games. Instead of him carrying his cash around, I have him enter it all into the bank book and then I take a quick shot of it with my phone. This way, when the opportunities come up where I would let him spend his dollars, such as on rides, or maybe small items he sees, we can have a conversation about using his saved dollars wisely. Hope you have a fun and safe holiday weekend! Happy Parenting. Activity dollars are a terrific motivator for the summer because there are so many things for kids to do, like amusement parks, zoos and children's museums. Let them spend them on the ability to choose the destination, or for actual rides at the place of interest. When the dollars run out, it's an easier conversation to explain that they should save some dollars for the next time rather than a temper tantrum about how mean you are to make them leave before they want to. It's all how you frame the situation which can be the difference between appreciation and taking something for granted. We have Teacher Bonuses and Tickets! We just made it a whole lot easier for your child's teachers with custom Teacher Bonuses and Tickets. We've created simple bonuses and tickets to send to school with your young one. They don't have much detail on them besides a box that says "what needs to be talked about at home" so you don't even have to explain what KidCash is. This adds transparency even when you're not there by giving your teachers the power to be a part of the Daily Meeting conversation. Print and use them for FREE here: http://kidcash.com/thank-a-teacher#teacher-bonus Happy Parenting! It's teacher appreciation month!!! KidCash would like to especially thank those who tirelessly spend their days brightening up our world and future. Education is the one hope I have that can truly impact most of the problems that face our world today. We've created a special page where we invite you to write a special thank you message to a teacher who has touched your life. We would love for other teachers to read these, and know that perhaps twenty years from now, some small child sitting in their class may feel the same way. We have also put up tips on how you can use KidCash to help get your children motivated in school, give teachers more transparency and make their job easier. Go now to: http://kidcash.com/thank-a-teacher Happy Parenting! Make sure they are spending their KidCash so that they understand the value of it. We want you to be successful using the system and one thing that can easily slip past you is forgetting to make them use the cash that they've earned in some way, whether immediate or towards a goal. It could be things that you would normally be doing, like asking for a candy dollar for putting some chocolate in their milk, or a dessert. It could be paying for a small amount of time on the smart tablet playing educational games. It could be using leftover dollars for a toy that they are saving up for with a goal sheet. It could be using the gift dollars to buy someone else a gift. We've added 163 Educational Videos from Youtube! Have trouble getting your kids to go to bed on their own? We've made it easier by creating a page of 9 videos to show them why getting a good night's rest is important: http://kidcash.com/brainstorm/sleeping When you combine education with incentives, you not only get them over the hump of trying it your way, but you get even deeper by convincing them that they should want to care for their own bodies and health. Let them know that you only want what's good for them. The videos also offer an outside opinion separate from your own which only furthers trust. Happy Parenting! Your kids may never look at spaghetti the same way again... Teaching them the concepts of teamwork is not only good for them, but will align their motivation to want to follow the rules and help you where they can. By creating this sense of responsibility to your fellow family members, you will be communicating trust, love and collaboration. To me, the concept of a team isn't something I just made up to convince them to follow the rules, it's how I realistically look at my family. We rely on each other for many things and should always be looking for ways to help one another. I like to explain things to my children in the context of teamwork whenever possible. An article posted by livescience.com explores the findings of a study done to gauge the stickiness of certain personality traits assessed from elementary school age. The results have been published in the journal Social Psychological and Personality Science. Using data from a 1960s study of approximately 2,400 ethnically diverse school children in Hawaii, researchers compared teacher personality ratings of the students of students from first to sixth grade to videotaped interviews of 144 of those individuals forty years later. 18 colorful fun and FREE wallets for your children to print and fold right now! http://www.kidcash.com/free-printable-wallets Happy Parenting! I feel like some miracle took place. Our two year old Emma had her crib transitioned into a toddler bed last night. Prior, she puts up a good resistance to sleep daily, screaming in her crib to be let out until she conks out so I wasn't very hopeful. Our plan was to not let her nap. Then I made her watch the sleep videos I set up on this page: http://kidcash.com/brainstorm/sleeping Then I asked her if she wanted to be a big girl and go to bed like Ryan. I asked if she wanted to maybe start getting dollars too. She does this really cute thing where she nods her entire head while keeping eye contact. I asked her if she was old enough for her bed or did she still need a baby bed. And then I walked out. I was then genuinely surprised to see she stayed in there with not even a whimper of protest. I might give her a bonus dollar tonight right before bed to really reinforce this, remind her again how important sleep is, and hope this sits strongly with her....you know...because we want to have our nights too. ha Happy Parenting! Selfishness - Teaching the joy of looking outside of yourself There are times that Ryan for whatever reason gets cranky, and then starts to have a tantrum because he's not getting food fast enough, or not enough attention. He seems really focused on this issue at the time and it's hard to break him out of it. So when he gets like this, I like to ask him if he's thinking about himself too much. For example, I'm doing all that I can to make his breakfast quickly, yet did he think about his fish that are still waiting to eat, or the dog that hasn't been fed yet. Our First Truly Important Decision One of the earliest questions we had after designing the product was...how are we going to make this? After doing a lot of research, it turns out printing KidCash in America was going to cost us about three times as much as printing it in China. The answer seemed easy but then a larger question popped up, what kind of company do we want to be? Do we want money to make all of our decisions or do we want our values and what we think is important to lead the way. Our main purpose is to lead young children in the right direction in hopes that they will better our future. We need to to do the same. Our margins are tight but we feel good about every angle of our business and at the end of the day, that's really all that matters. When we realized that our core integrity should always come first, every decision after this one was easy to make. Leading by direct example...making the connection between school and your job. A large way that KidCash changes the experience in the relationship between young ones and their parents is that it brings many of their experiences into alignment with their parents. Children can get a sense of the bigger picture, feel part of a close knit team, and see how they and their parents fit into the larger world around them. When Ryan questions why he should go to school, I tell him it’s because it’s the first part of learning how to go to work. I then explain to him WHY I go to work. I even show him the bills, walk around pointing at objects and telling him how many dollars it takes a month to keep things running. Ryan is of course very familiar with the concept of money and dollars, having earned allowance since he was two and change. One of the most powerful aspects of KidCash is the ability to explain why rules exist in a way where the child sees that you are not enforcing rules to gain power and control, but because you care about them and want them to learn how to take care of themselves. A good example is when your child stays up too late, or doesn't want to go to sleep on time. I don't know about you, but I relish these teachable moments. So let's see what happens... Your child was really excited, maybe had a few cookies and an ice cream cone and now doesn't want to go to sleep. As an adult, I know what is about to happen and so I tell the child that night, hey...if you don't get enough sleep, you're going to feel pretty crappy tomorrow. Are you sure you want to stay up? First off, from conception until now, I want to thank everybody so much for their interest and support of this product. To tell you a little background information, before I became a mother, I was (and am) a user experience designer. I have been fine tuning my skills for over fifteen years now. My job is to watch carefully how something works, how people use these interfaces/experiences and use these observations to innovate ways to change it to become easier to use and more effective. Kids are naturally curious, and this natural inclination can often lead them down the wrong path. For most children, they either want to test boundaries, don't fully understand societal rules or just wanted something and didn't think it was harming anybody. Opportunities will always be somewhere down the path for your children but if caught early and treated with love and the right information, it can easily be corrected. An important role of the parent and caretaker is to do our best to cover these bases as early as possible, allowing opportunities to communicate the things that happen beyond the one act that we think is harmful. If we solidify enough of these values with them when they're young, they will know how to handle themselves as adults. Beyond stickers on a chart, we ask children to balance several currencies, bonuses, tickets and bank books. Surprisingly, this complexity leads to an easier learning experience for children because it more directly relates to the life they watch their parents lead. A child can easily put into context how they fit into the family and society. Young ones using this system weigh their decisions against their income and goals, just as we do. The stability of a micro-ecosystem empowers them with the ability to work towards the things they want, while making the rules that limit them make common sense. You will see your children acclimate because of the same psychological reasons we as adults function day to day, waking up to work, following the rules of a company, abiding by civilian laws, paying fines when we break them and making sure our bills are taken care of.